As someone who has been in school for about 18 years now, and will be in school for at least four more, I have come to the realization that I love learning and being exposed to different ways of viewing the world. As long as I can remember, I have always felt comfortable in a school setting and/or a class environment. While reflecting on my own learning experiences, I have noticed that many of my most enriching educational experiences inside and outside of the classroom have come during times when I am exposed to and/or engaging ways of viewing the world that are different than my own. Underlying my preference for learning about different viewpoints is the fact that I am the type of person who always tries to make connections between different ideas, behaviors, and experiences. 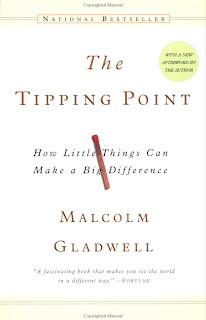 That is why I really enjoyed reading Malcolm Gladwell's (2000, 2002) "The Tipping Point." To my understanding, "The Tipping Point" operates on the premise that there is a connection between biological or medical epidemics, and what he calls "social epidemics." In particular, he argues that just as diseases can spread primarily though irrational events and occurrences, or through a few key players (e.g. people with AIDS who sleep with and infect large multiples of people), social epidemics such as fashion, smoking, and suicide trends (just to name a few) can spread in the same way. Now even with all of my psuedo (or not so psuedo)-conspiracy theories about how everything's connected, even I thought his argument that social epidemics spread similarly to biological/medical epidemics was a stretch. And although there are some aspects of his argument that I disagree with, I think that he raises some very thought-provoking points about a variety of social phenomena that we should pay attention to. Although he starts of the book drawing connections between biological/medical epidemics and social epidemics, the book focuses on analyses and explanations of the latter. Because he situates all human phenomena within a social context, he argues that social epidemics are primarily the result of the actions of three types of people: Connectors, Mavens, and Salesmen. Connectors are people who are well - connected such that they know tons of people. Connectors tend to have a gift for attracting (not in a romantic way) and maintaining connections with people. Mavens are the people who like to learn about and teach people things. As a result, they are very knowledgeable about many things. They are the type of people who always want to share information with other people. Lastly, Salesmen are the people with the mouthpiece. In other words, they are the people who have a gift for persuading others to believe or do something. According to Gladwell, these three types of people are the most important in spreading a social epidemic. The Connectors get everyone together, Mavens provide them with the information, and the Salesmen persuades them to "get on board" with the movement. LOL hater! I'll bet you anything that Bishop Greene has read the Tipping Point. it's a good book. You my want to check it out as well.